The Indianapolis-area apartment market, including downtown, remains strong, despite a deluge of new units coming online and hundreds more in the pipeline. 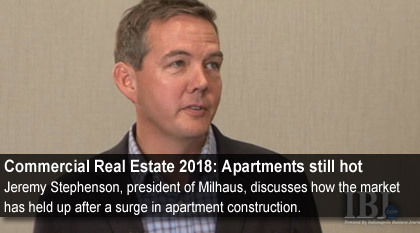 That’s the assessment of Jeremy Stephenson, president of the Indianapolis-based apartment developer Milhaus, which built Circa and Artistry downtown, among other projects, and is currently building a $23 million apartment and retail development at College Avenue and Kessler Boulevard. “Overall, the market continues to be in very good shape, and the new supply coming online in the next few years starts to temper a little bit,” Stephenson said. Stephenson was one of six panelists at Wednesday morning’s IBJ Commercial Real Estate Power Breakfast, which drew more than 600 people to the Marriott Indianapolis downtown. Panelists discussed a range of topics, from the future of Circle Centre and Broad Ripple High School to the tenants that developer Hendricks Commercial Properties is luring to its 1.2-million-square-foot, mixed-use Bottleworks project on the eastern end of Mass Ave. Helping stoke Bottleworks and other developments downtown is the growing residential base in and adjacent to the Mile Square, much of it in the form of apartments. According to data from apartment specialist Tikijian Associates, 1,030 new apartments came online downtown in 2017 and another 761 are expected this year. In 2019, another 1,488 units are expected. Among the large projects under construction are Penrose on Mass, Bottleworks and the second phase of CityWay. The three together will add more than 800 apartments. One major high-end project that came online this year was the 27-story 360 Market Square apartment tower, which has 292 units. “I do think there will be a little challenge on the upper end of the market in terms of occupancy," given the increase in supply, Stephenson said. But he said strong fundamentals—including steady job growth—are keeping supply and demand in balance. He said young professionals, from new college graduates to those in their early 30s, are delaying historical marriage and household-formation patterns and appreciate the mobility and flexibility renting provides. On the other end of the spectrum, baby boomers are moving downtown and like renting because it frees them from having to make long-term commitments.